Headaches can be associated with many different things such as fatigue, PMS and sinusitis. However they can often occur from dehydration and a lack of particular nutrients, so it is vital to include these in your daily diet. 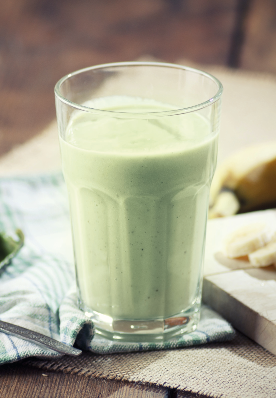 Try this smoothie to help clear your head. This is also great as a preventative too. Sally says: "Bananas are packed full of nutrients including good levels of magnesium and potassium, two minerals important for preventing headaches. Magnesium is a fantastic relaxant and can help reduce tension in the muscles. Potassium deficiency can cause headaches and associated symptoms such as vomiting and nausea. "Spinach contains good levels of B vitamins including riboflavin, otherwise known as vitamin B2. This is necessary for the production of energy. Some headaches can be triggered by fatigue so it is essential to keep up those energy levels. Spinach is also a good source of magnesium, which is vital for energy production. "Headaches can often be caused by dehydration through loss of electrolytes. Coconut water is one of the richest natural sources of electrolytes and can be used to prevent dehydration from strenuous exercise or when in hot climates. It is also a great hangover cure! "Ginger has been used for centuries for its numerous therapeutic benefits. It has a fantastic anti-inflammatory property which can help reduce inflammation of the blood vessels."